A new documentary about the making of the original, groundbreaking blockbuster "Star Wars" focuses not on its stars or special effects, but on the nameless extras and bit players who populated that galaxy far, far away. Overall, "Elstree 1976" is more about the life of background extras (or "supporting artists") who work anonymously to help bring movie worlds to life while never saying a word. The title refers to Elstree Studios, the film and TV production center north of London that, in the boiling summer of 1976, was home to what would become -- unpredictably -- one of the biggest hits of all time. The film reflects on a very different era, when aspiring actors could just worm there way onto a film set, or by chance come upon a casting audition. To most, it was just another job, acquired through a friend of a friend or by a call from Central Casting. Most weren't all that excited or impressed, thinking it just another job, although science fiction fan Angus MacInnes said, when he first walked onto the soundstage, "I thought I'd died and gone to heaven. The ships were all busted up, nothing looked pristine; everything looked like it'd been used, and I thought, 'Somebody knows what they're doing here.'" The film, written and directed by Jon Spira ("Anyone Can Play Guitar"), is not authorized by Lucasfilm, and there is no backstage footage from 1976 showing the extras going through their paces. But there are photos, clips of deleted scenes, and colorful stories about bit players' interactions with the stars. The interchangeability of background actors is highlighted in the fact that, in the ceremonial closing scene of "Star Wars," Derek Lyons played both a rebel guard at the entrance of the Throne Room, AND an aide who hands over the medals as they were being presented on the other end of the hall. And while most of Garrick Hagon's scenes as Luke's friend Biggs Darklighter were cut (prompting an understandable amount of anger and regret), he also got to don a stormtrooper helmet to question Alec Guinness and Mark Hamill in Mos Eisley, so there's THAT. Their notoriety of having worked on "Star Wars" or its sequels has made them welcome at sci-fi conventions, where they sign memorabilia and engage with fans who will happily wear stormtrooper and X-wing pilot costumes without being paid for it. The extras' connection to "Star Wars"' success may be tenuous (they'll point to an action figure and say, "That's me! I was one of those! "), and there is tension among them as to who has the right to autograph a movie poster. But the aura of nostalgia, and the fans' desire to experience as close a connection to their beloved film as possible, turns these actors into cherished guests on "the circuit." The only big-name figure in "Elstree 1976" is David Prowse, a bodybuilder who broke into acting in Stanley Kubrick's "A Clockwork Orange," and who played the Dark Lord Darth Vader in the first three films. He expresses a modicum of regret for having his voice replaced (it being the great James Earl Jones' dulcet tones softened the blow), but says he's been barred from officially-sanctioned "Star Wars" events over his contention that he was more than just a guy in a suit -- he WAS Darth Vader! Still, Prowse is "eternally grateful" for the opportunity to have embodied "the ultimate screen villain." As a behind-the-scenes document on the making of "Star Wars," "Elstree 1976" is thin on material of interest beyond the biggest fans. But as a film about the serendipity, hardships and regrets of a working actor's life, it is a humane portrait that gives these artists a bit of the dignity they so seldom realize in real life. Some of those interviewed gave up film, having gone into education, restaurant ownership or martial arts instruction. But even those who managed to build a long career in front of the cameras (albeit in the background) know their notoriety -- and this documentary's intrinsic interest -- comes down to their anonymous appearance nearly 40 years ago in a cultural behemoth, all while disguised by masks, helmets, visors or alien makeup. 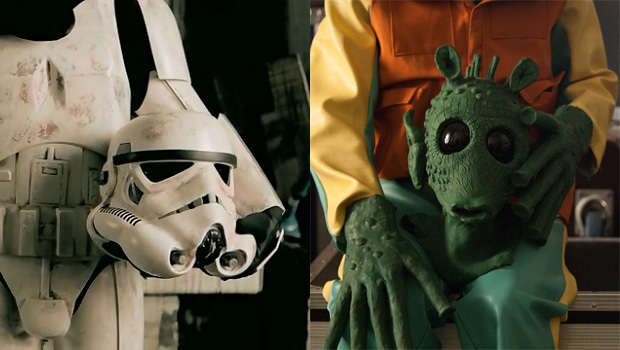 As Paul Blake admits, his tombstone will read, "Here lies Greedo" -- and that is fine with him. "Elstree 1976" (distributed by Film Rise) opens in theatres in select cities on Friday, May 6. (See list of screening locations.) It is also available via iTunes. To watch a trailer click on the player below.